The Infantry School's mission comprises the development and formulation of the Infantry's fundamentals, in the areas of conceptual planning, doctrine training and organisation as well as the procurement and use of defence materiel. It is also tasked with the co-ordination of the future development of three infantry branches – light infantry, mountain infantry and airborne infantry and the common fields of infantry operations and dismounted close combat. The German Army today comprises ten infantry formations with different weapon systems and equipment but which are generally comprised of three nearly identical companies. When deploying infantry forces to out of area operations, eight armoured infantry battalions can also be called upon. At the Bundesheer, responsibility for the Armoured Infantry is with the Armour School. Germany first deployed infantry overseas in 1993 in Somalia (UNOSOM II) with subsequent deployment to theatres including the Congo and the Former Yugoslavia. 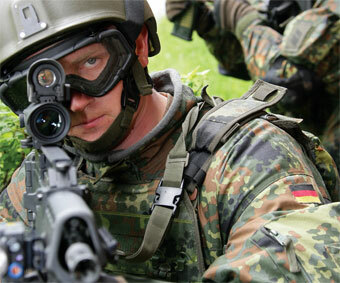 From 2001 to the present day Germany has also contributed troops to ISAF. Over this period the force structure of the German army has experienced a total of five different transformation phases, will all seeing reductions. This however is changing with the lessons learned from current operations. The Army provides the core of more than twenty German units in Afghanistan. Amongst them two training and protection battalions, including four manoeuvre companies, two recce companies, two engineer companies and five headquarters or headquarter supply companies. The training and protection battalions are staged as Mazar-i-Sharif and Kunduz and comprise different small combat support elements. The composition and organisation of the operational battalions in Afghanistan still vary considerably from the basic structure of the infantry battalion in Germany although the two are converging at an increasing pace. The main elements conducting operations in close co-operation with the armed forces of the Afghan national Army are two training and protection battalions comprising two infantry companies and supporting elements. The main differences at the platoon and company level are in vehicle equipment. The Fuchs APC has explained Lt. Col. Rausch, proved very effective, admittedly with specific equipment optimised for the operations in Afghanistan. The Marder infantry fighting vehicle is the standard fighting vehicle of the armoured infantry and has also been successful in theatre. The Dingo and the Eagle are additional deployment-specific procurements. The lessons learned from operations, has led to the decision being made to keep a vehicle mix in Afghanistan that comprises the Dingo the APC Fuchs, the Eagle and Marder. For the infantry units on ISAF Combat operations, engagements have become the rule not the exception and are typically confronted with opponents in section to company strength. In the western part of the area of operations the German troops typically have to conduct long range options whereas in the Kunduz area they have a more limited radius. Germany has lost 45 soldiers during the ISAF campaign. The opponent typically retains the initiative, making effective use of cover and blends with the indigenous population to avoid being engaged by mortar artillery or aircraft fire. The Taliban vary their methods between sniper fire at range of ranges of 800-1500m, AK-47 in salvos at ranges exceeding 300m and opening fire at very close ranges between zero and 20m. In addition to dismounted combat against an asymmetric adversary in urban terrain, German infantry will have to keep its capability to conduct air mobile operations. Their air transport ability will remain, as will the ability to operate in difficult terrain and under extreme climatic conditions.